Ruth and Jane in front of a house made from a barrack that their family lived in. We immersed ourselves in homesteading today, stopping first at the Homestead Museum in Powell, then getting a tour of barracks turned into homes from the Blackburn sisters, Ruth and Jane. The two lively woman are daughters of the well-known Blackburn family who were one of the first to homestead in the Heart Mountain area. You’ll not find a more knowledgeable and outspoken pair to guide you around Cody. Meeting at the Heart Mountain Interpretive Center we head west to the mountain and on to L13H, Lane 13H, where we have been driving the past few days. The sisters pointed out several outbuildings and houses that were barracks. They generally knew the current occupants and definitely knew who the original homesteaders were. Then Jane exclaimed, “Here we are at the Blackburn homestead!” Sharon pulls the car into a driveway in front of an off-white wood house with a small wood log fence and a large motor home parked off to the side. This was a half barrack with very few modifications. 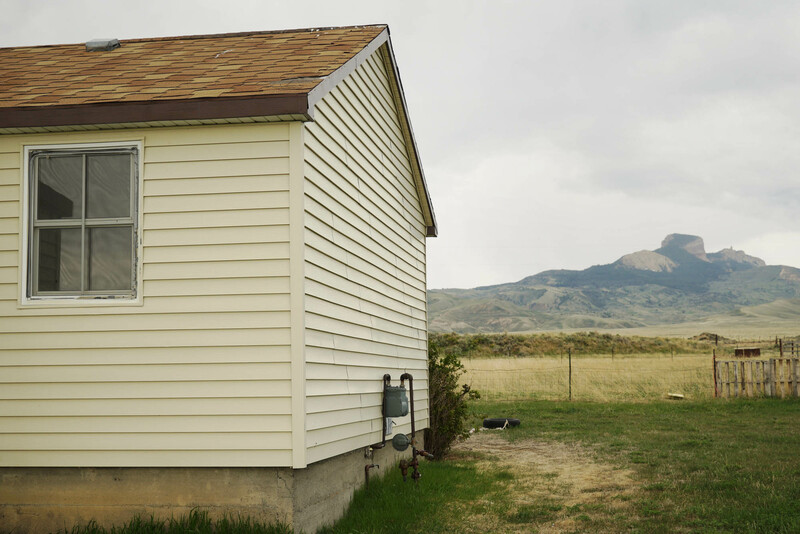 A small mud room was added on to one side, horizontal siding was attached to the exterior, modern shingles and a satellite tv antenna were on the roof. A utility pole rises up from a front corner of the house, a huge mail box inexplicably placed about 10 feet off the ground. The family actually lived about 20 yards to the side of this house in different barrack at the time they settled there. They clearly remembered living on the rough land after moving from Kansas. Jane boldly poked around the property, the current owners not home at the time. The original windows could be seen on the back side of the house. They were pleased to have their photo taken in front of the house, easily embracing each other in a sign of sisterly love. The ditch rider’s home, a former barrack, with a view. Jane directed Sharon to drive down a narrow dirt road paralleling a water canal, passing the “Private Road” sign. 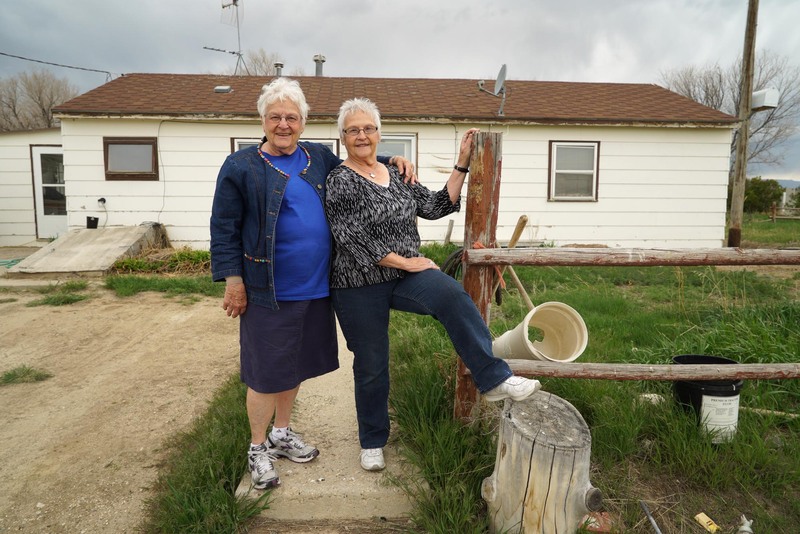 We encountered a woman from the Heart Mountain Irrigation District, Jane quickly talked us pass and we drove up to the ditch rider’s house. We learn a ditch rider manages the water as it flows through the canals to farms. One lives in a former barrack with a pretty spectacular view of Heart Mountain. Back at the interpretive center, another quest. 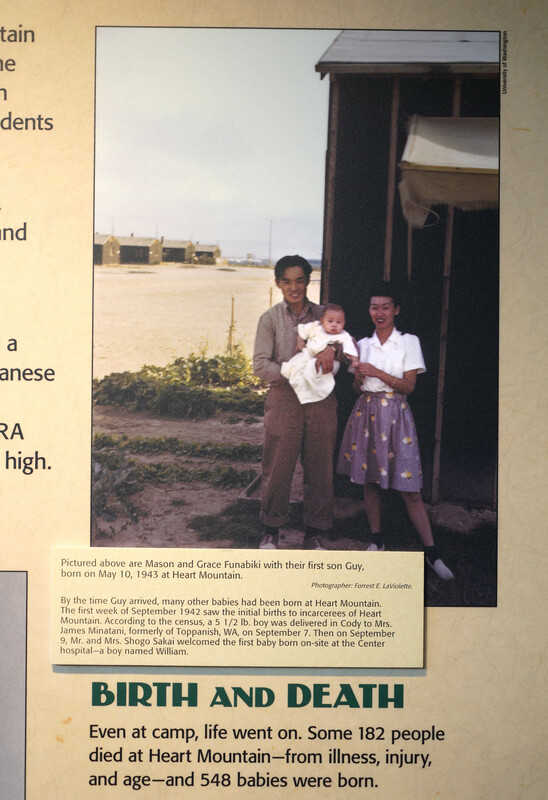 My friend Jon Funabiki said his parents and older brother are pictured in a display and with help I find a large color photograph of Mason and Grace Funabiki with their first son Guy, born May 10, 1943 in the camp. Mason and Grace Funabiki with newborn son Guy in display at the Heart Mountain Interpretive Center. Earlier in the day Sharon introduced met to Rowene Weems, the director of the Homesteader Museum. The passionate woman showed us displays of the Shoshone Project, a huge irrigation plan started in 1907 with the Heart Mountain district being implemented in 1946, this was what led to the barracks being sold to homesteaders. Many photos from the 1940’s show barracks being moved and placed on farmers’ land. Until this trip, Heart Mountain meant one thing to me- the internment camp and the Japanese American story. I realize now Heart Mountain means many things to different people in this region, all linked to the distinctive mountain always on the horizon.